So the law isn’t any bar to using the factual information Debbie wants to use. But what about that limited use license that says “(r)epublication … of any of the Content … is prohibited”? Because — no matter what the exact words are — there’s no way that Find A Grave really means that a user like Debbie can’t use the purely factual information on the site, giving — of course! — proper credit to the site as the source. Using specific factual information for a blog post, by contrast, is exactly why Find A Grave exists — to make information about our families more accessible and more useful. Not to lock it away. I am still a little confused, Judy. If I upload a photograph I am agreeing to transfer my copyright of the photograph to Find A Grave? If I want to copy a photograph I now have to ask permission from Find A Grave instead of the photographer? I am not liking that at all if that is the case. You quoted, “Other Website users may be able to copy, download, store, edit, change or delete certain content that you post.” Would these “other websites” be violating copyright if they are taking my photographs without my permission (assuming the answer to my first question is that I actually do retain copyright). (b) The quoted sentence speaks of other Website users, not other websites. 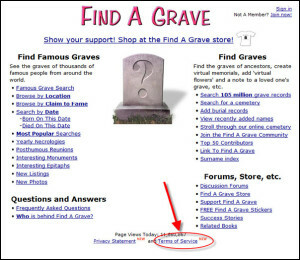 In other words, they’re talking about Find A Grave users being able to copy, download, store, etc., info from Find A Grave. (c) Yes, absolutely, anyone who republishes an image you took and uploaded to Find A Grave without your permission is violating your copyright (unless the specific use can be considered fair use, and use of 100% of an item is rarely if ever fair use). Someone on Ancestry.com’s Facebook group is trying to say that headstone photos posted to Findagrave and other graving websites don’t qualify under U.S. copyright law because they don’t meet the definition of “creative” to be considered. What have courts said on the matter? I was under the impression photos were generally considered copyright protected except in cases of where someone was photographing a copyrighted item and a few other exceptions. Here’s his exact wording. The poster is correct that “Copyright exists only when there is some evidence of creativity.” Creativity in photography is usually found by the choices that the photographer makes. If the single choice is “point and shoot,” then copyright may be difficult to assert. More commonly, the choices are angle, lighting, sometimes use of filters and more, and in those cases the requisite “spark” the courts look for is likely to be found. Thank you Judy. In many cases, Findagrave photos were taken as “point and shoot”. Some are obviously taken in the spirit of creativity. I find many fall in between where I cannot tell if the person did “point and shoot” or not. I don’t mind if people use my photos. I find a lot of people do mind so thought I should ask an expert. I always ask if the person has not left a note in their bio or in the photo notes. Thanks for the quick reply. That made it much clearer to me. When I post a photograph of a tombstone I do so because I want to share it with researchers who may be interested in that person and are not able to travel to the cemetery themselves. Also, I want to preserve the image of the individual’s tombstone so that they will be remembered. Getting credit is not why I do it. Those are my reasons as well, Patricia. But giving credit to the photographer is one very good way to say “thank you” to all those volunteers who go out, selflessly, on their own time and on their own nickel, and slog through the mud and the briars and the snakes. Putting all the copyright issues aside for a minute, it’s just plain the right thing to do to acknowledge their efforts and their contribution to the community. I am SO glad to hear you say that, Judy. I have been preaching this very thing for what seems like eons. I always say “Photo courtesy of (insert name) and Find-A-Grave” when I copy it for my tree. So my thanks to you for emphasizing the right thing to do. I agree whole-heartedly. That’s why I do it as well, so that present and future family historians may see their relatives or friends memorials and photos. Not for profit – not for recognition. Recognition is appropriate, though, Connie — it’s a kind of formal thanks to those like you who do go take the images. Many of the photographs I have personally taken and/or owned, and put on my Find-a-Grave Memorials, turn up on other websites and trees, in particular Ancestry. There have been instances were they were used incorrectly. Am I the owner of the copyright on these photographs, and can anything be done to stop people from posting photographs on other websites – or is “the cat out of bag” on this one? If you have personally taken the photograph, then you own the copyright and you can insist that anyone else not use the image. Merely owning a photo may not make you the copyright holder. Could you comment on the obituaries that are posted on some of the pages? I assume that the original poster should obtain the permission of the newspaper where it first appeared. Do I need to get permission to copy the information to my genealogy program? If so, from whom should I request permission? On another point, I am looking forward to meeting you on 9/21 when you speak at RELIC in Manassas, Virginia. First, I’m very much looking forward to this Saturday at RELIC! Please make sure you introduce yourself, Harold! Second, I’ve written about obits before, and they break down into the pre-1963 time period and the post-1963 time period. Let me know if those don’t answer your question. I have seen many pages from Findagrave post on Ancestry. Because these show the whole format of the page, picture, structure of the information, I have assumed that that would not be legal, however saving an image or information to your computer and computer and then adding it to you Ancestry page would be. Is that correct? There appears to be a sharing agreement of some kind between Ancestry and Find A Grave in effect there, Ann. There’s certainly some sort of linking system since you can click on a Find A Grave image at Ancestry and it will take you to Find A Grave. No matter how you share an image, however, you must have legal authority to use it on Ancestry — so always get permission of the copyright holder. Judy, are you seeing something on Ancestry that I’m not? I do not see “a Find A Grave image at Ancestry” only an *listing from an index*, which links to the Find A Grave memorial. Any Find A Grave image I have seen *on* Ancestry was added by users, not Ancestry. You may well be right about that, Jackie, and a linking agreement of course isn’t going to involve copyright at all. Personal use means saving it to your computer or printing out, correct? Uploading it to another website, such as ancestry would be republishing, not personal use. Okay, does this mean that I can not make a copy of the Find a Grave Memorial and add it to my FTM program no mater is I added the memorial or someone else did? I think the purpose of it is to protect themselves from those who would just crawl their website, steal all their data, and then use it to make their own competitive grave website. That’s my guess. Yep, that’s pretty much my take, Kip. I’m still not clear on one thing. At Find-A-Grave I might find HUNDREDS of pictures I’d like to use when I publish my own genealogy. Do I have have to get in touch with every photographer on every site to get their permission – Or can I just copy the picture and give them credit in my own genealogy? Can’t I just say “This picture of Great- Grampaw’s Tombstone was found on the “Find-A-Grave Website”? Where you find the photographs makes NO difference in your right — or lack of any right — to re-use them. Find them one by one on hundreds of individual sites or find 100s all together aggregated on Find-A-Grave, the copyright of each photo still belongs to each individual photographer and, if the photographer’s info doesn’t give permission to re-use the image, then you need each photographer’s permission. You may not copy and republish (such as on your own website) the work of someone else without violating copyright. That’s different from, and in addition to, needing to give credit (“photo by…”). Oh my word, would you all get a life. I can’t believe this conversation. If you are so possessive about your pictures, then DON’T post them. The web would be a mighty bleak and barren landscape if everyone who owned copyrighted content followed your advice and kept it to themselves. How about just being a good neighbor and asking permission before using someone else’s work? Thank you. I was beginning to think the same thing. Do the photographers want to help those doing genealogy to be able to fill in their blanks with photographs or are they expecting people to go, “Oooo, Ahhh, such a lovely photograph of a tombstone.” Egad. If Find-A-Grave and Ancestry let this persist (and they are all owned by Ancestry) maybe it is time to forget Find-A-Grave and create a site dedicated to SHARING. 2 weeks ago I received email about photo that was at Gravestone Photo Project. I informed the submitter that she owns the copyright and she licensed the GPP the same rights Findagrave gets. That anyone else wishing to reprint that photograph needs to get permission from the submitter who owns the copyright to do so and the person needs to grant appropriate credits (the photo credit belongs to that submitter, and the citation credit to the GPP where the original photo had been submitted to.) That requester did the right thing on both counts. Now only if those who copy the photos and put in their trees, would do right thing – credits where due. When is the Decoration Reunion at Old Bakersville Cemetery this year 2016? What does the law say about a Findagrave contributor copying burial information (names, dates, etc) from a published genealogy book? Can someone buy a genealogy book on a cemetery which lists the burials of said cemetery and then use that information to enter memorials on the Findagrave website? All without giving the author of the genealogy book any credit or without obtaining permission from the author of the book. The law doesn’t protect facts: those can’t be copyrighted. So names, dates, places… no copyright protection. That doesn’t mean it’s ethical to swipe the results of the hard work of, for example, a genealogical society which has canvassed a cemetery and is selling the book to fund its work. But unfortunately ethics often takes a back seat. I do not agree with all of these people who get so angry over a photo of a headstone for several reasons; first, if the person who wants a copy of the photo is a descendant then they should be able to use it in their genealogy instead of people getting angry because the person “stole” their copyrighted photo. I believe people are sometimes stepping on graves to take a photo of a headstone which is disrespectful at the very least. Years ago before find a grave was as it is today I contacted a find a graver in Ga. because I wanted a photo of my gr grandfather’s headstone so one of them volunteered to take the photo and he sent it to me. Now, so many years later when I dropped ancestry.com after they gave us a couple of days to get rid of of our family pages they at one time in the beginning gave to us and the strangest thing; in those two days you could not get in to your private page to remove your info but especially any photos you may have uploaded to your page so I feel ancestry took photos that did not belong to them and in a sneaky way. They also took the photo that the find a graver did for me in Georgia that was on my computer. One more thing, a question, I designed my former husband’s headstone. He died at a young age but he loved music and playing poker so I worked with the monument company and designed it myself to have musical notes put on the stone as well as a Royal Straight Flush. Now, who should own that copyright I ask? It was designed by me. Oh, and one more thing; my sister was a known writer who died some years ago but it seems everyone and their sister can take her writings and put them online when her books are still being sold. How does that work? I must admit, sometimes I feel a little anger when I see people using her work when any money made from her work should go to her daughters. There should be a way for people to have feelings for the people left behind instead of trying to take as many photos as they possibly can. Recently, a friend of mine lost her youngest brother and not long after his death she called me crying because she had found someone on find a grave had him with a man supposedly his father but it was not his father and she was enraged and crying because, besides losing a younger sibling, she also lost her dad when she was a little girl. Luckily, the find a grave member who put the info on find a grave was good enough to change the information quickly which made my friend feel much better and I really respect the person who was the find a graver.There need to be more like him than people who think they are award winning photographers because they take a photo of headstones yet do not even want to share the photos with people who would appreciate them the most, family, descendants, and friends. It is just sad that people cannot have a heart when it comes to the family left behind no matter how many generations. My personal pics from my Find a Grave, account memorials were copied and displayed on Ancestry. All information and pics have been posted on Ancestry from my FAG memorials, so there is no copy right. I don’t know if FAG has given my photos or info to ancestry or if it is another FAG member? FAG members just go and take pics of headstones at the graveyards close to where they live and display them on FAG and call that genealogy; and then they get credited for the most memorials posted on FAG and their name is put on a list on FAG. If your relative is one of these people then you most likely have no right to the memorial unless it’s a close relative. The whole thing stinks. If you post a memorial for a relative and you do not know where in the state they are buried then someone else can come along after you and add a second memorial after the one you have posted and scream “it’s a double” even though the original memorial predates the second posted memorial?? So the people who have access to the graveyards are posting pics of grave stones on FAG think they are doing historical reasearch? Some of these headstone pics that are posted on FAG are of people still living and when you point that out no one cares. The only reason I post my relatives is to keep their memory intact and out of the hands of the grave yard squatters at FAG who want to see their names posted as having taken and posted most memorials at FAG as this is not true genealogy. Find A Grave is owned by Ancestry now, and the system allows images from Find A Grave to be displayed by others. That’s accepted under the terms and conditions. People should not download the images and reupload them as their own, however. Is the phrase “Find a Grave” under copy write protection? Am I able to use it on my cemetery website to direct my guest to a word searchable map of my cemetery? 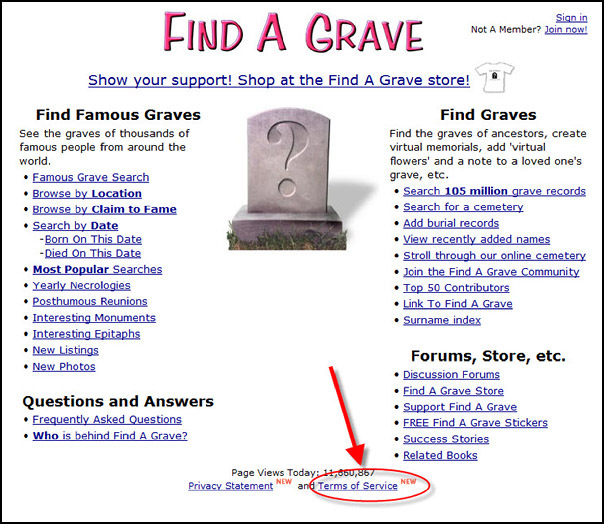 Ancestry does hold a trademark on the name “Find A Grave) (see USPTO database here). Although it’s a common phrase and, in lower case letters, is in common usage, in your shoes, I’d probably go with a different phrase like “locate a grave” just to be safe.